The future of naval warfare will likely include lasers, auto-cannons, and hypersonic missiles launched from the other side of the horizon. But while it may not have a defense against frickin' lasers, China's newly unveiled Type 1130 close-in weapon system can make short work of inbound warheads travelling at four times the speed of sound. 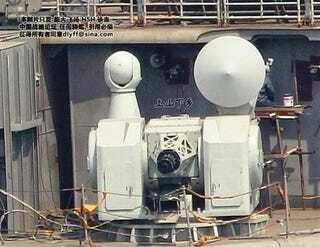 It reportedly does so by spewing 10,000 rounds per minute—166 rounds per second—perforating any inbound threat well before it can do any damage to the PLA Type 054A frigate that the 1130 has been installed on. According to the Want China Times, a Chinese news outlet, the Type 1130 carries a pair of 1280-round magazines—enough to shoot down as many as 40 threats before requiring a reload. It's also reportedly quite accurate, notching 90 percent accuracy against hypersonic threats. It can also target fixed wing and rotary aircraft, surface ships, terrestrial targets along a coast, and even sea mines with its 30 mm rounds. Details on the weapon system are scarce, but if its 6 to 10-barreled predecessors are any indication, the Type 1130 should be able to target threats anywhere from 8 to 20 km out. Due to the limited range of the Gatling gun it employs, however, the system shouldn't actually be able to engage until the threat is right on top of it, around 3 km.